Sometimes I have EPs on my wantlist for years, due to scarcity or cost, and once I finally track them down I can’t help but be underwhelmed and think… “I spent that much time/money/time and money for THIS?? 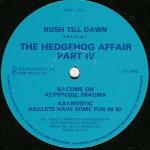 ?” “Hedgehog Affair IV” is not one of those EPs. I finally picked this EP up recently on the cheap, and knew as soon as I dropped the needle onto the first track that it was worth waiting for… The EP as a whole is really strong, so much so it’s hard to pick just one track to post. This first track is a bit less “Basement Records-y” than the others but is still catchy and rad, a straightahead no-nonsense great rave track. Some of these later non-Basement Ron Wells related releases are a bit hard to find and are really wicked, maybe a bit more melodic than the stuff on Basement while still having that driving “jungle techno” underpinning. There’s even a straight up 4/4 acid techno stomper on this EP. Oh yeah, it sounds like my needles are going yet again so this rip is kinda noisy. Found this a couple years ago at the sadly short lived play de vintage in toronto. Top. woah, do you mean there was a separate Play De Record that only had vintage stuff (presumably stuff from their basement?) Sounds epic!! Did Gunns run that place?